A new artisanal shop with locally sourced jellies and Nutella bacon glazes seems to open every week now, and it can be hard to determine what's really worth it. 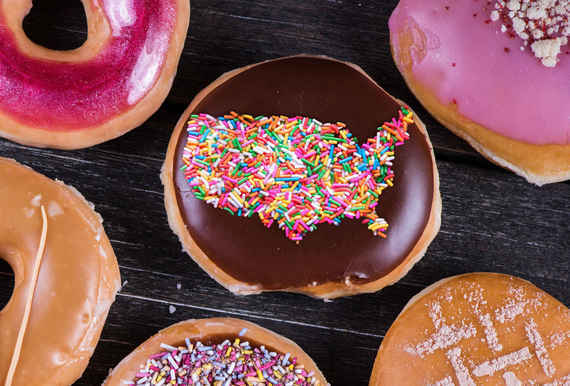 That's why we determined the best donut destination in every state in America just for you. 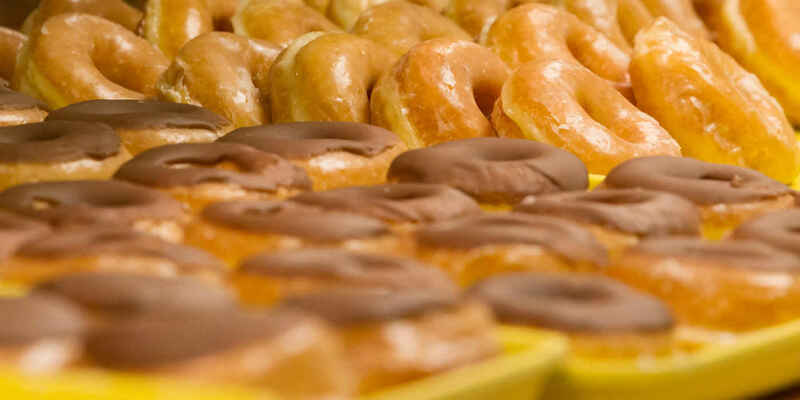 Homer Simpson isn't exactly known for sage thinking, but he did create one important mantra: "Mmm donuts." Clearly he knew something we didn't, because 23 years after the insatiable patriarch first uttered his signature line, everyone is outright obsessed with donuts. A new artisanal shop with locally sourced jellies and Nutella bacon glazes seems to open every week now, and with all that new real estate, it can be hard to determine what's really worth it. But it's not impossible! That is why we determined the best donut destination in every state in America just for you. 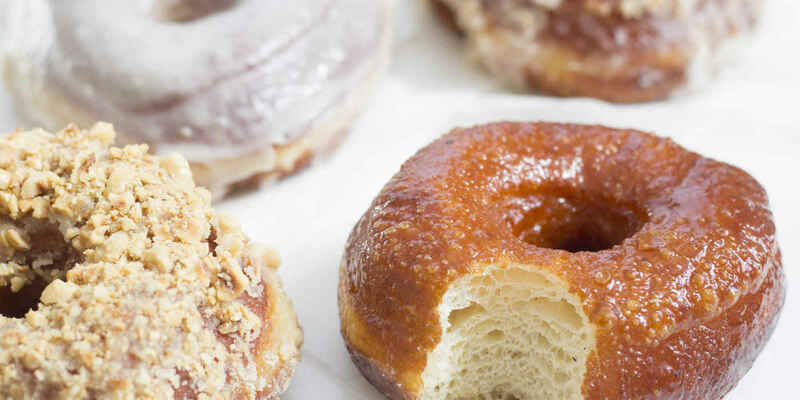 Don't expect to find a s'mores donut or a maple bacon cruller at Loyless -- this old-school shop is all about simple, hand-made, hand-iced classics. These basics sell out at the crack of dawn, though, so make sure to show up by 7am sharp. Donuts were never exactly the purview of dinosaurs, but Dino's sticky treats and espresso are sold under the banner of a green cartoon Brontosaurus who apparently loves eating jelly-filled pastries a whole lot more than prehistoric plants. Most of the donuts, and the "dino bones" are only $1.30 a pop, which is damn good price in the current fancy donut market. Some brother and sister combos are fraught with agitation. Others, like Sophy and Keng Se, can move beyond sibling rivalry and come together to launch delicious donut shops in Tucson. Their Young Donuts opened just four years back, but it's already built quite a name for itself, even with almost no online presence. Maybe it's because they strategically opened next to a children's dentist office to hook their clients young, and holy crap... that might be where the name comes from. If practice makes perfect, Mark is pretty much a demigod at this point. This unassuming spot has been rolling dough since 1978 for hungry Arkansans. Little has changed, as you can see from the faded sign out front, but when you're making cream-filled and coconut-coated donuts that are this spot-on, you don't need to flip the script. Donut Bar has attracted rabid press attention pretty much since it opened, and a quick scan through its Instagram explains why. Monte Cristo donuts! Crème brûlée donuts! 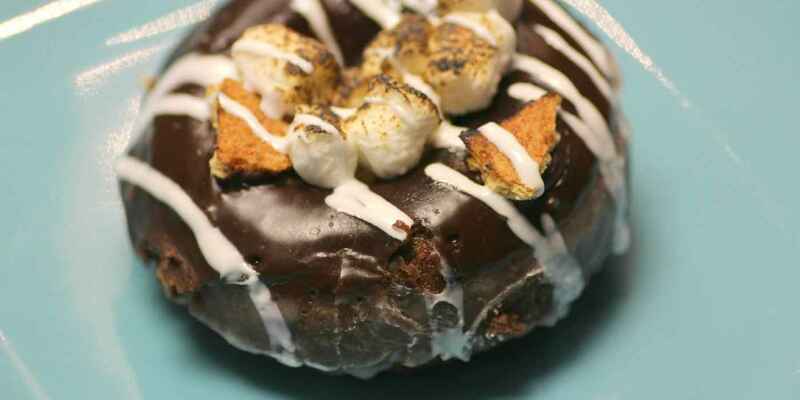 Whole Snickers bar donuts! If you dream it, this place probably already did it, like, six months ago. And yes, of course there's actual booze in its bourbon maple creations. It's a bar. Alright, fine: Dottie's Diner isn't technically a "donut shop." It's a confirmed greasy spoon, but we had to make an exception here because the donuts here are too fantastic to deny. The fresh-daily roster includes plain, powdered, cinnamon, jelly, or chocolate-dipped. Don't order breakfast without them. Strip mall food is definitely questionable, but you're in good hands at this Pembroke Pines shop. 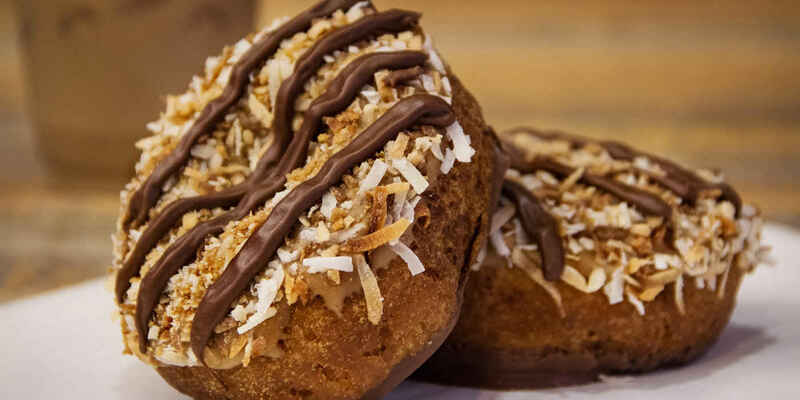 Mojo Donuts opens every day at 6am and closes when the last donut is sold, so make sure to claim your Key lime pie or s'mores early, lest the hungry hordes beat you to it. Like most revolutionaries, the bakers here have bold ideas. Donuts need to be one contained circle of dough? Screw that, they cut one open, stuffed it with peaches, and called it a slider. Pistachios are uninspired? Well, they sprinkled some on orange icing and it's transcendent. If the Bolsheviks were peddling stuff like this, we'd all be carrying sickles. You don't meet many "Leonards" nowadays, but this particular one is doing his best to associate the name with tasty, sugar-filled treats. The goods here are Portuguese-style malasadas, which means they have no center holes. But that just gives you more fried dough (and custard and cinnamon sugar) to tear through, so well done, Lenny. Some like their vaults stuffed with cash, but we've always preferred ours to be piled high with fried dough confectioneries. At this Windy City institution, the staff is happy to ring up a triple chocolate or lemon poppy seed for you on the old-timey cash register, so long as they're not sold out. If they are, try your luck with its new food truck/pastry van. When you see the typical weekend lines, you'll understand why this Indy spot is called Long's!! One of its cinnamon fried or blueberry cake numbers are totally worth the wait though. Have your cash ready, 'cause it does not accept cards. On its website, Daylight Donuts proclaims, "Donuts. Coffee. WiFi. You'll never have to leave!" And considering the robust list of 89-cent treats, that's probably true. Just be sure to set up camp on the weekend, as that's when Daylight offers its peanut butter-filled donuts. The Donut Whole caters to all sorts of taste. Do you want to listen to live bluegrass on a Friday night? It hosts concerts in its lounge every week. Would you rather catch up with your friend over boba tea? They're molding the tapioca balls as we speak. Want excellent from-scratch donuts? They're kind of the main event. So swing by for a Sunshine Citrus Crunch (citrus glaze and cereal) or King Midas (vanilla, peanuts, and Lyle's Golden Syrup). Unseasoned donut eaters might get confused when you tell them the long johns at Nord's are incredible, but pros know you're not eating a cozy undergarment -- you're eating a super-sized donut. 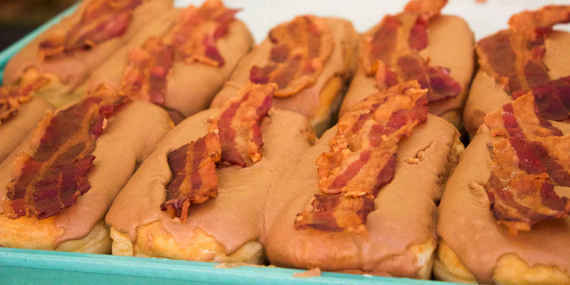 And the ones at here come with bacon on top. Some people will tell you to get a beignet at Café du Monde and consider their work done. But we don't feel comfortable basing a pick solely on beignets. Yes, it's deep-fried dough, but it's not technically a donut. For something more traditional, head to DISTRICT. The two-year-old shop offers donuts "simple," "fancy," or "extra fancy," but the Dough-La-Mode with Creole Creamery ice cream in the middle is the move you want to make. Portland, ME, has a similar spirit to Portland, OR, so of course one of the city's most beloved donuts shops insists on making its pastries out of local potatoes. This isn't some hip nonsense, though. Holy Donut's spudnuts are just as delicious as the flour-based treats you know -- arguably more so when they add that coffee brandy icing. Fries and ice cream tend to hog the boardwalk cuisine spotlight, but anyone who's frequented Ocean City knows The Fractured Prune is the real star. The marshmallow-, mocha-, and honey-glazed pastries are the kind of thing you will fight an enterprising seagull over, and lucky for America, the mini-chain is expanding to new coastlines. 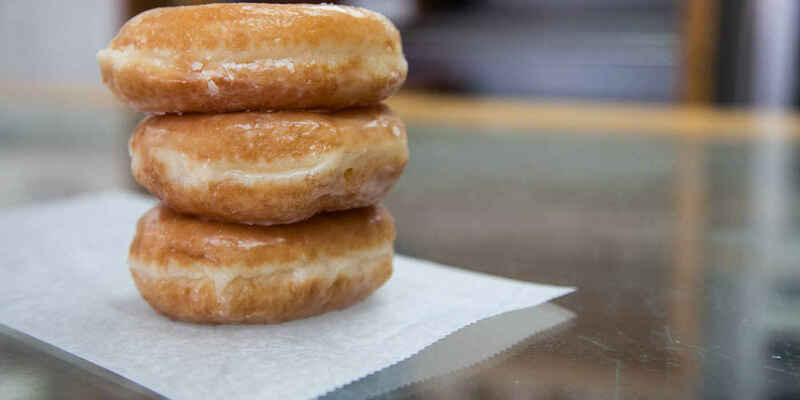 For those raised on Dunkin' Donuts, the prices at Union Square Donuts might seem steep. But when $3 is all that stands between you and a Brown Butter Hazelnut Crunch or "FluffaNutta" (OK, that one's $3.50) pastry, you swallow the deluxe cost. Along with a mouthful of peanut butter pastry cream. This Michigan mill has a bountiful selection, but its candy bar series is probably the most impressive. 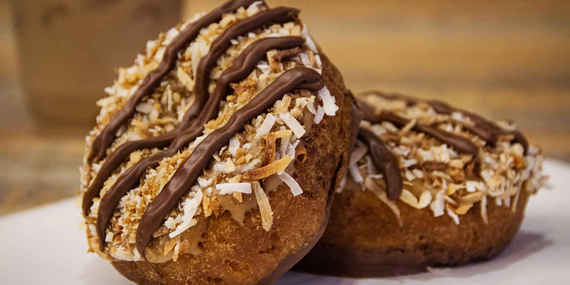 The Reese's Donut, Snickers, and Mounds of Coconut are all based on deconstructed and remade versions of your favorite treats and are rebuilt into a new pastry. The final products are, like, three times bigger than the original candies, so make sure to pay your compliments to the chef. And schedule a dental cleaning immediately thereafter. In case you were wondering, the glam dolls in question are co-owners Teresa Fox and Arwyn Birch. These ladies teamed up to create a vintage-inspired shop with one seriously inventive menu. Everything is made from scratch -- and the dairy is locally sourced from the Hope Creamery -- so you know they aren't messing around. Another sign they're serious? The peanut butter and Sriracha Chart Topper. Like its pal over in Portland, Tato-Nut Cafe is mighty proud of its potato dough. So much so that it bills itself as home of "the only real donut." The blueberry cake variety is the attraction here, but the Persian (a sort-of glazed cinnamon bun) is also pretty popular. Offering a a dozen donut flavors is fine, but 103 -- the amount you'll find on this landmark menu -- is incomparable. To find out what donut shops made the list for the other half of the states, get the full story at Thrillist.com!